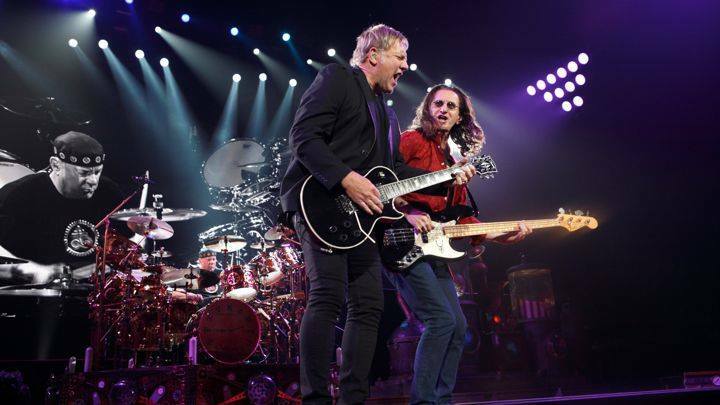 Rush are premiering a performance of their 1980 track, “Jacob’s Ladder”, as a preview to the forthcoming “R40 Live” release. The tune from the band’s seventh album, “Permanent Waves”, follows the debut of the lead track, “Roll The Bones”, from the package set for release on November 20. Available as a 3CD/Blu-ray or DVD set as well as standalone options for the concert film or live album, “R40 Live” captures the band in concert in their hometown of Toronto over two nights this past June. The concerts at the Air Canada Centre marked the first time Rush have filmed in their hometown in almost 20 years, dating back to a 1997 recording at the Molson Canadian Amphitheatre on the Test For Echo tour.